Bart Standard 15" x 8"
PitStopUSA.com - Bart Standard 15" x 8"
Bart Standard Weight Wheels will fit any racer's budget. 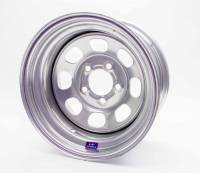 Wheels are 360 degree welded construction and available in all popular sizes in painted or chrome finish. Bart Standard 15" x 8" - 5 x 5"
Bart Standard Weight Wheel - Silver - 15" x 8" - 5 x 5" Bolt Circle - 5" Back Spacing - 28 lbs. More About Bart Standard 15" x 8"